Did Somebody Ask for This? "Helps me remember why I drink coffee." These are two pages of caracter drawings I did for Universal Press (I'm stuck on the old name) for the strip's sales kit in 2007. Syndicate salesman send these brochures, with samples, descriptions, etc., to propspective newspapers. 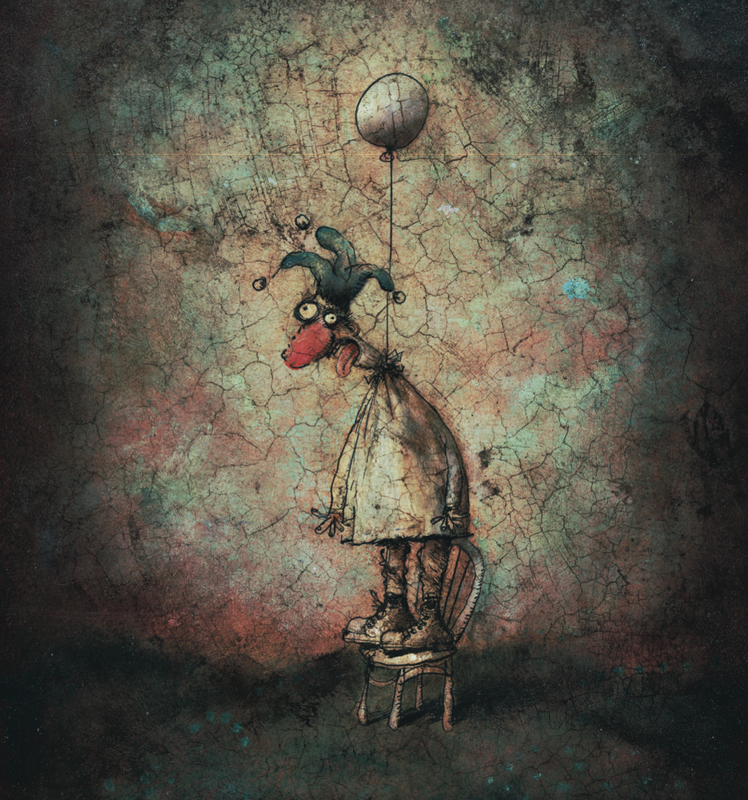 The cover of the first book, This Exit, is from the cover of the sales kit. 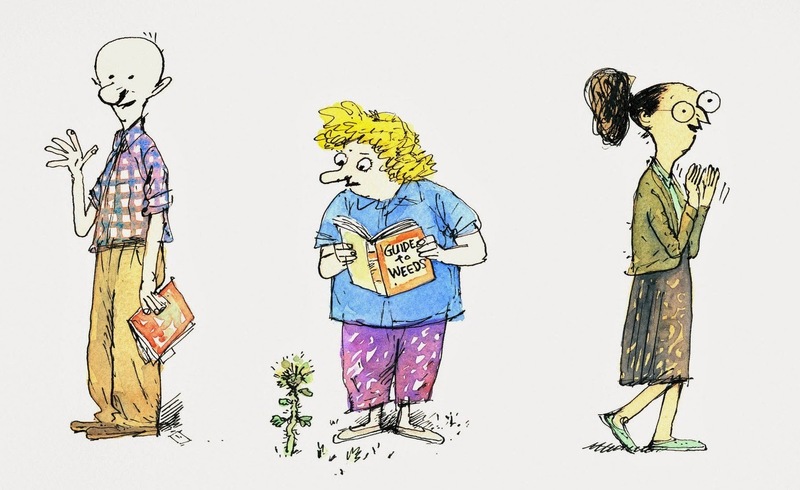 I was real happy with the way these characters turned out, especially Ms. Otterloop, who I always had trouble drawing, as she's rather formless. I even fooled myself into thinking I'd figured out how to draw them. 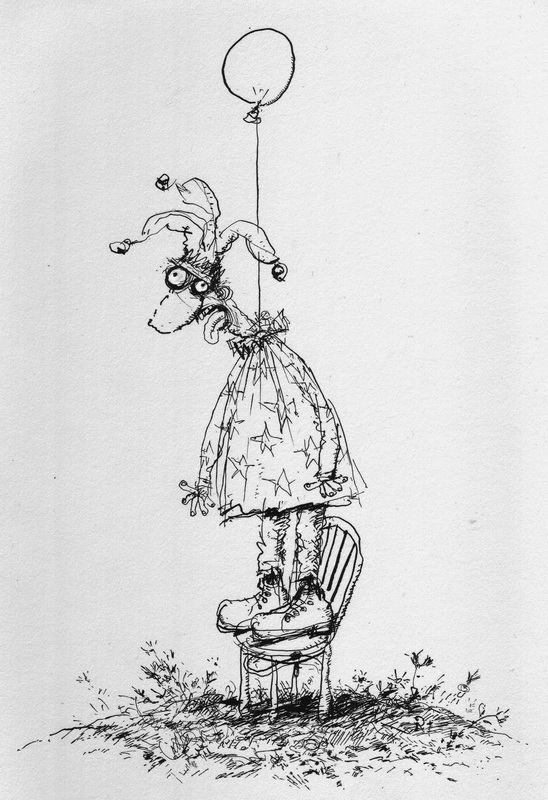 From about 1980-1990 there were several portfolio pieces I worked and reworked, as I was 1. anxious to show my best possible stuff to the fantastical and somewhat imaginary audience of art directors, all of whom were hypercritical geniuses, and 2. put it off as long as I could. 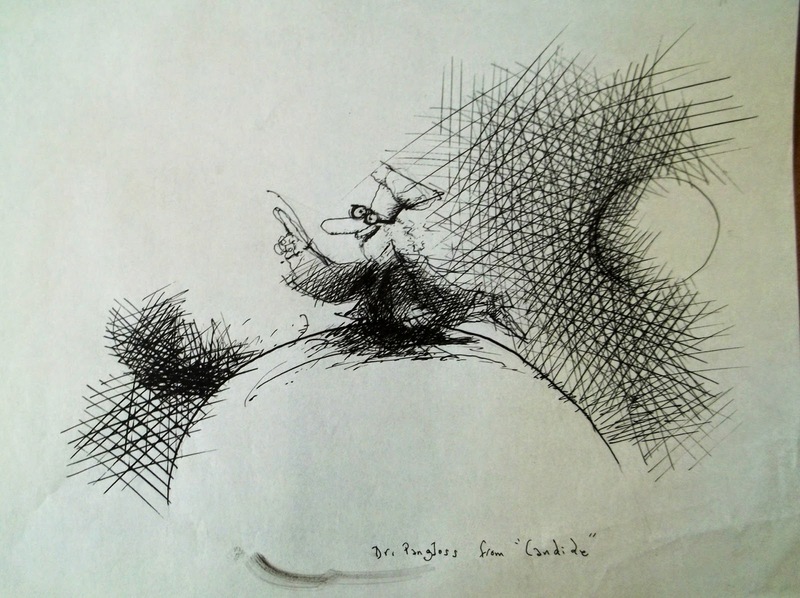 Among the pieces, which also include a cartoon slapstick version of Debussy's Afternoon of a Faun (don't ask) and illustrations for Voltaire's Candide, was a thing I called the Pinhead Ballet. 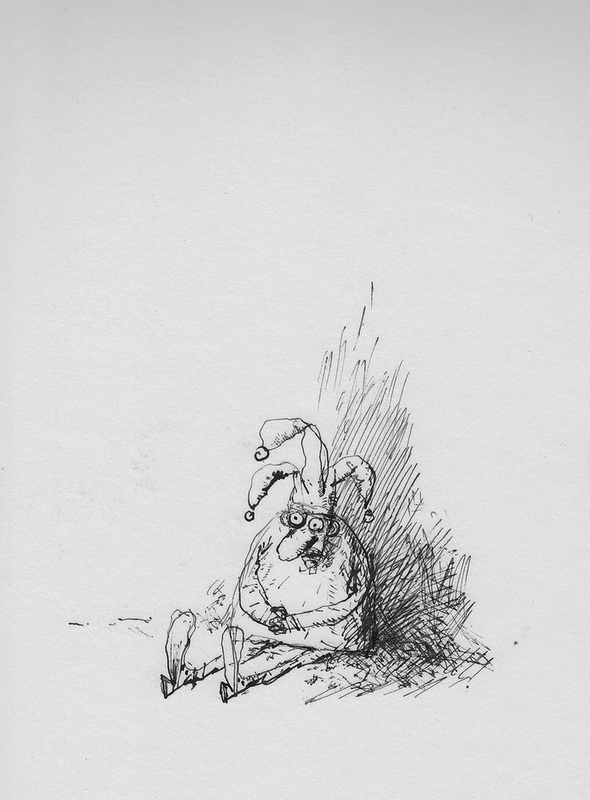 It began as most tthings do- a random little sketch, on a page of the same. I recognized the sketch's potential and imagined it as one in a series, probably the last one. It was even titled "the Tragic Outcome" or something.. The trouble was none of the other sketches were as nasty as the first. A really ugly painting, like you'd find in an elderly relative's scary basement; painted by unknown hands and it hasn't aged well either. When it was finished I put a 2-step varnish on that would give it a fake cracquelleur (fun stuff), put it in a frame and hung it on the wall. Then Caitlin Mcgurk took it off the wall, out of the frame and put it in a case in Columbus, Ohio. Of a fat man eating our planet (who does he think he is, Galactus? ), done for I forget. 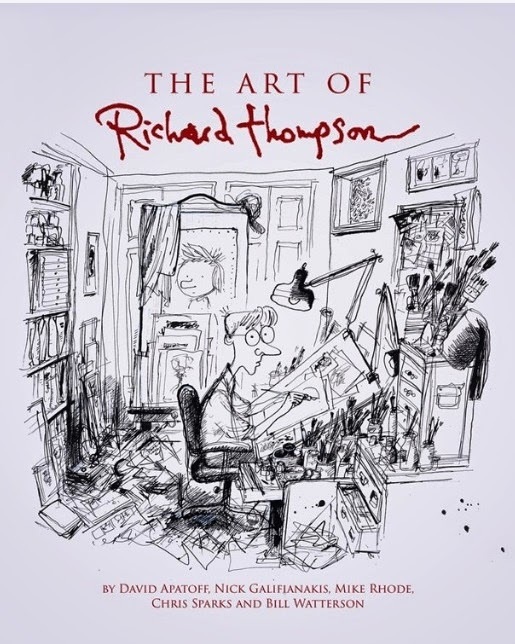 This post and others are part of my self-defeating plan to publish everything from the Art of Richard Thompson and drive down sales. This came out real well, as I was aiming for a smooth, yet subtly gradation in the background, and a big, scary bee in the fore. Of course, this is from 1990, so how can I remember what I was aiming for? To make up for the last post, and to lessen the intensity somewhat, here's this from the Post Health section. 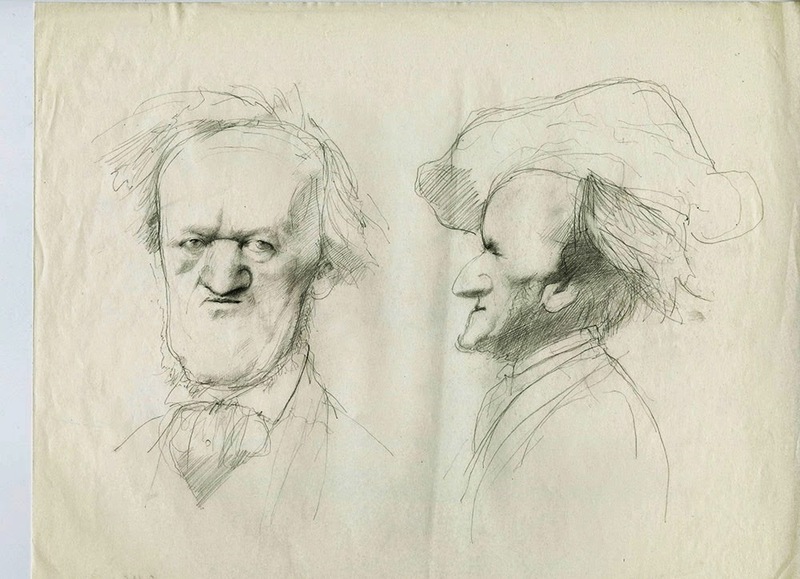 Richard Wagner was the first composer whose work I had a real infatuation with. I was in 11th grade and the history teacher, Mr. Honey, was introducing us to early 20th century European history. He dimmed the lights and turned on the record player in the back of the classroom and picked out some mood music, as he often did, and- Wait, you know what's coming next, right? 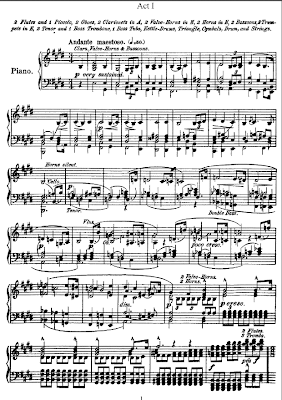 Well, suffice it to say that the details of the early stirrings of national feeling in post-World War I Germany were for me lost in the Prelude to Act III of Lohengrin. Immediately after the class I hit the school library and checked out an LP called something like "Best of Wagner", with excerpts from his operas. 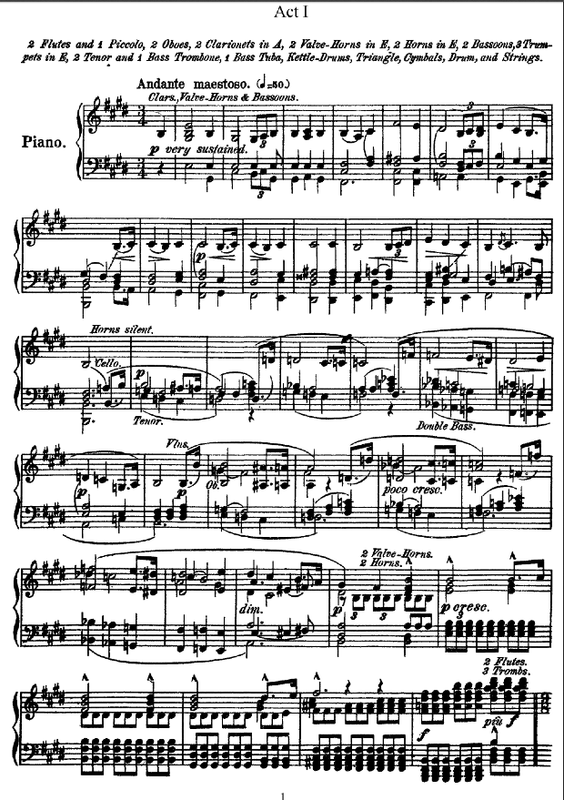 Including both of the Lohengrin preludes, Die Meistersinger Prelude, and the Overture to Tannhauser, which became my particular favorite and was the first thing I ever picked out and memorized on my brother's piano. Well, the first page, anyway; right afterward it gets too hard. The opening theme is then repeated with a galloping accompaniment that made my hair walk around on my head. It's a tune that gets heavy play in the Chuck Jones classic "What's Opera, Doc?" Pompous, vain and dictatorial, Wagner was a peach to draw, with a wardrobe straight out of a upholsterer's nightmare. Then there're his opinions, expressed loudly and at length, on politics, art, race, everything, each more hateful than the last. And yet, when the Ring begins in the E-flat darkness of a riverbed, when Wotan says farewell to his favorite daughter forever, when Eva launches the great quintet on Johannestag in medieval Nurnberg, all is forgiven, at least for the moment. So you know I'm going to try drawing this guy, for my own amusement if no one else's. His face is quite distinctive and caricatures easily, especially when topped off by one of the theatrical hats he affected. I had an ingenious technical idea: I'd paint the final in oils, but I'd use two colors that would fight each other. I'd use lead white and bitumen; lead white because it's fast- drying, permanent and thick, and bitumen because it was popular in the 19th Century, never fully dries, and therefore almost destroyed the 19th Century art it was used in. Over time, the painting would slowly fall apart, becoming dramatically uglier as the layers of paint, of equal permanence, shifted and cracked. However, I got bored with the whole project. 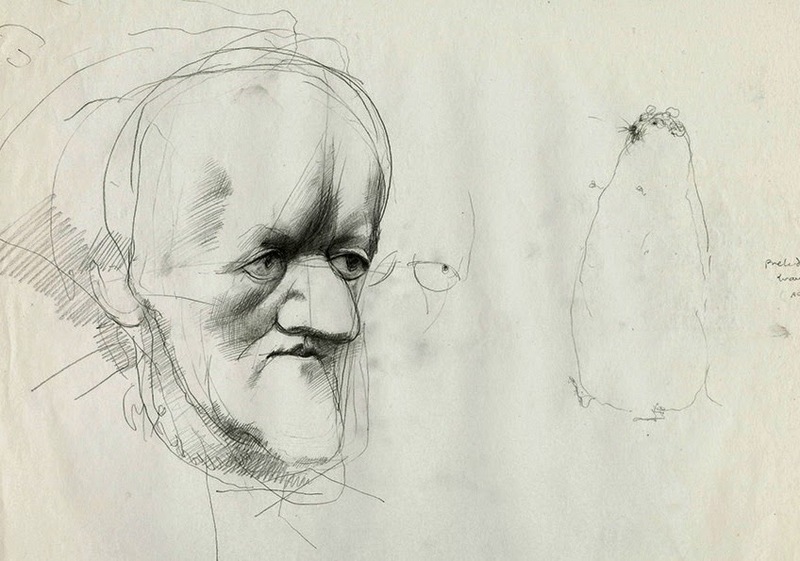 The painting was dull and didn't, as I secretly hoped, explode, but the sketches of Wagner were good. Here are a few. Besides, I get fed up with Wagner and his shenanigans, easily. I prefer Brahms. 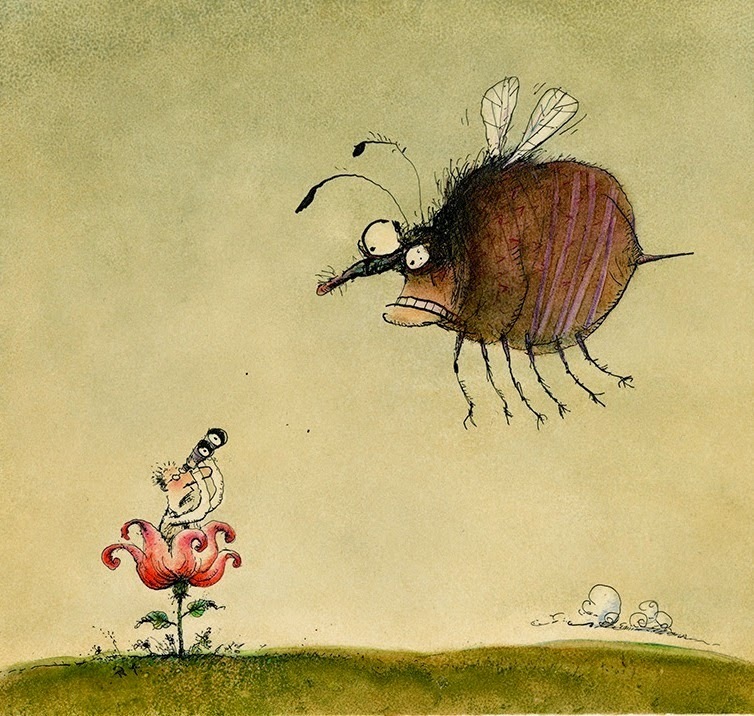 They had a good deal of mutual dislike, tempered by mutual respect. I'll bet Brahms would win if they ever had a rasslin' match though. 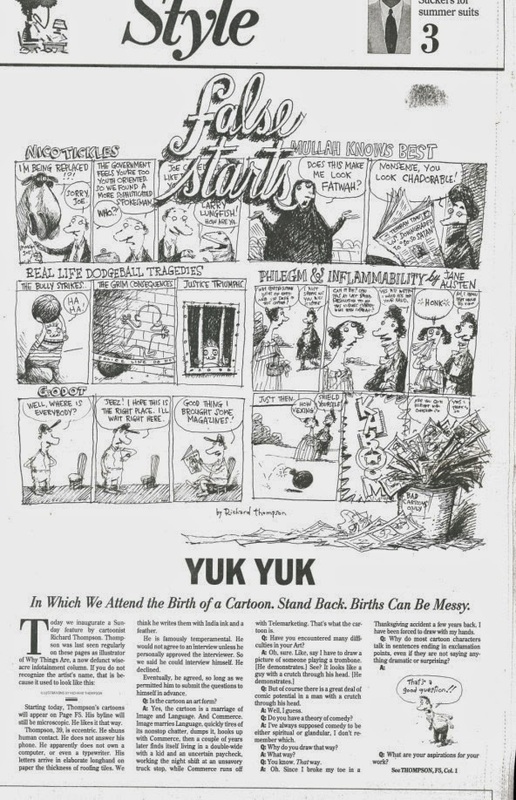 Thanksgiving was usually celebrated in CdS (during the Post Magazine days) with a full-page cartoon. As in previous years, I thought I'd just sort of pan around the dinner table, let everybody talk and the comedy would take care of itself. It didn't. It's funny enough, I guess but it could've been better. 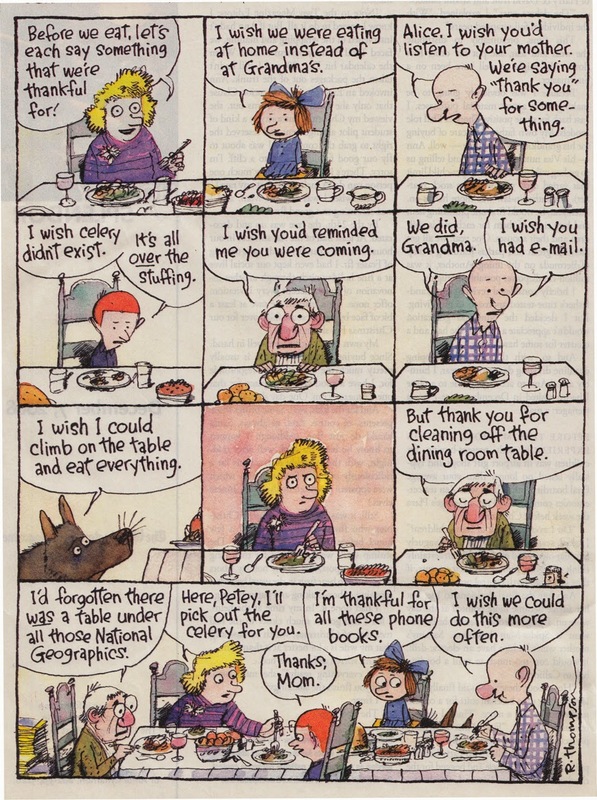 But here it is, from the depths of my studio's Lost & Found, Thanksgiving 200x. 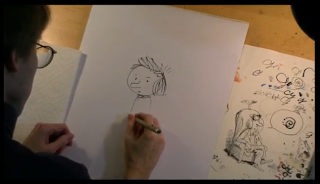 This is an image from The Art of book, and you can see what you'll get for your $23.09; unfinished pictures. I've done a lot of those over the years. Pictures that had something wrong with them, yet something right, or at least enough right that I'd keep working on them, intermittently, long after I should've consigned them to a trashcan. 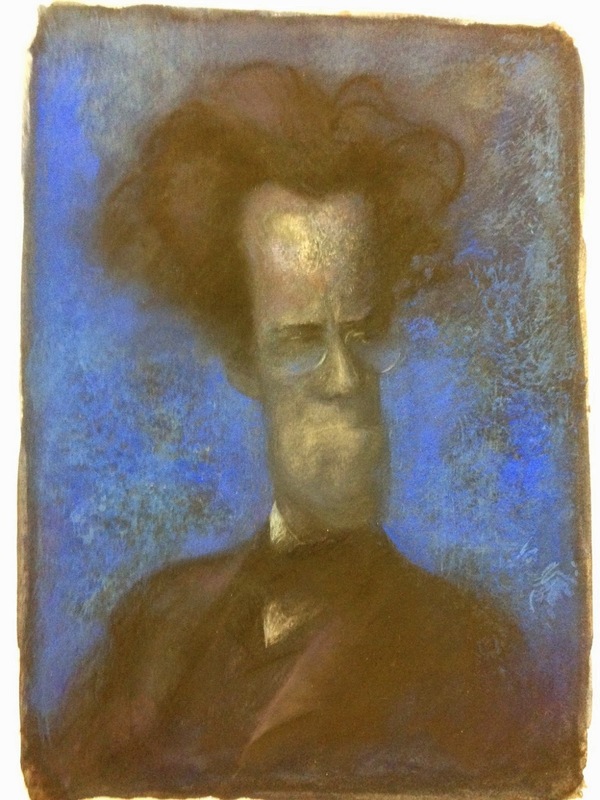 This caricature of Gustav Mahler, for example. He's not one of my big favorites. He's just too angsty, as you'd expect of the composer of Kinderotenlieder. I guess he'd be a little happier if he had a mouth. But this as far as I got before I messed up. 'Cause I'm angsty. 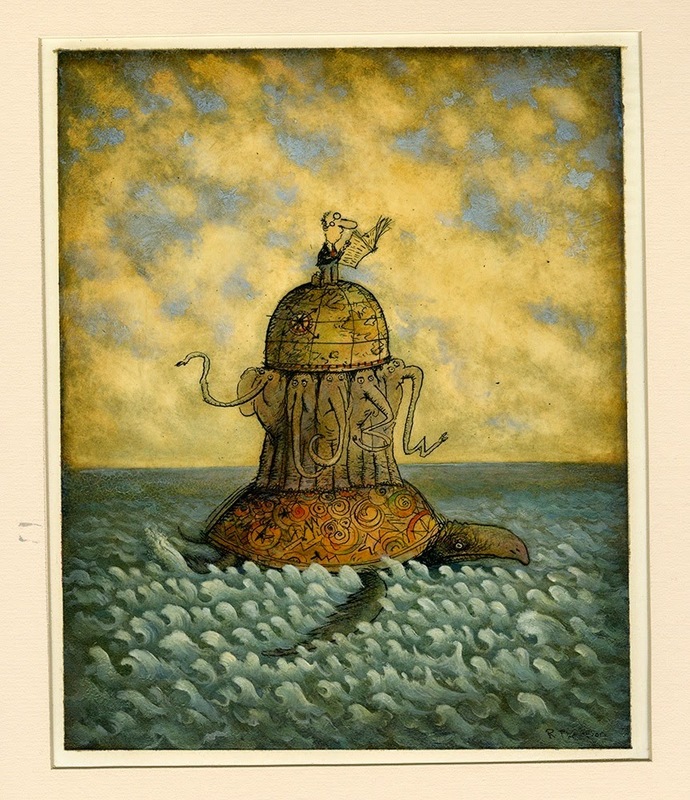 Some ancient civilization or another believed that the Earth was a dome carried by a team of elephants, who in turn were carried through the Heavens by a stupendous turtle. It made sense to me, at any rate, when I saw it referenced in a Time-Life book we had called Evolution (there was even a little picture of what such a thing might look like). 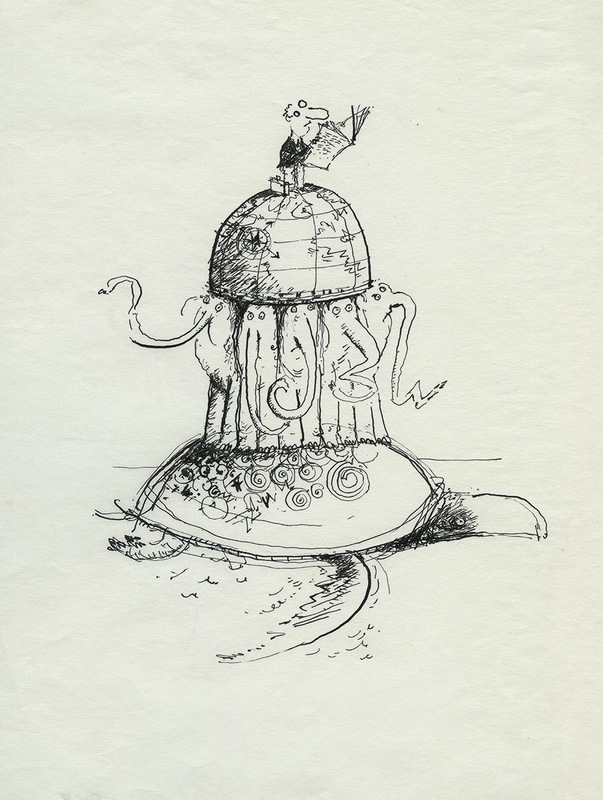 Then years later Terry Pratchett popularized it in his Discworld books, even giving the turtle a name (Atuan). 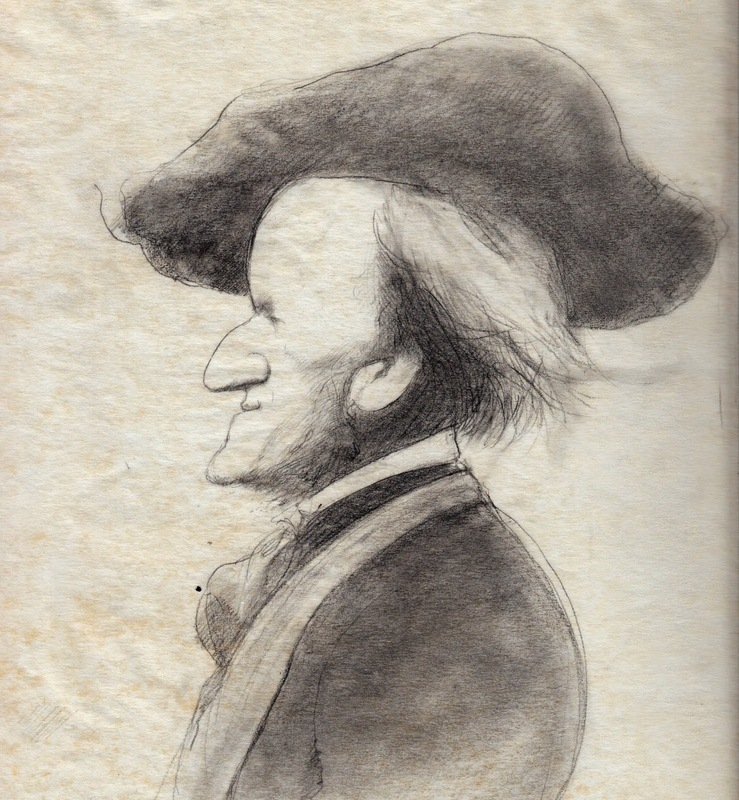 I did this sketch sometime in the mid-80s, put a little man on it, entitled it "the Commuter", and had it printed on the verso of the Beethoven caricature as a promo piece. So much for cosmology. 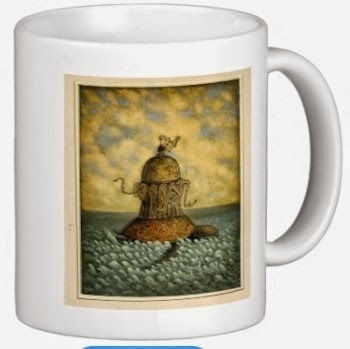 I like this because it reflects the confusion over selecting the cover for such a book- how do you boil something as amorphous down to one image? And what is art anyway? I hope this book has some no-nonsense answers, written in plain English. You can pre-order it HERE. 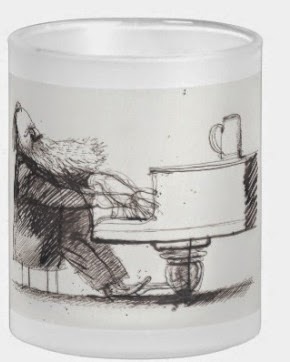 Brahms loved his beer, and now you can experience this great part of musical history for youself! 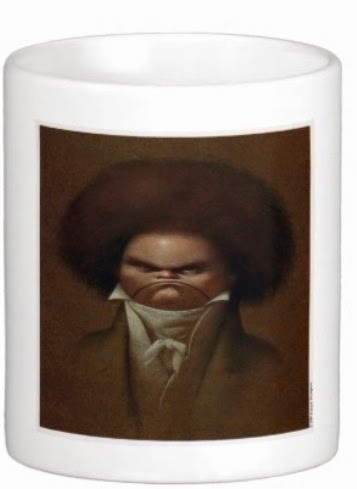 Only $20.95! Get 'em now, they won't last forever! 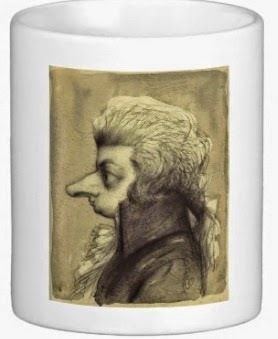 It's got a caricature of Wolfgang Amadeus on it. Who'd you think it'd be? Pyotr Ilyich Tchaikovsky? Only $14.95. 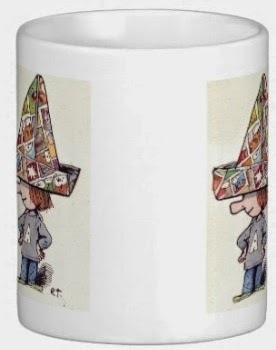 A new store at Zazzle! We're selling out big-time and that means savings galore on all merchandise in the newly-created Musicophrenology Store! Just don't ask us what "musicophrenology" means! It was that or "sears" and sears was taken. Say, don't you wish your morning mug of coffee was as grumpy as you? 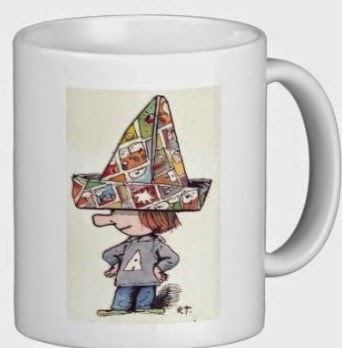 Well, here's one mug that's extra-super grouchy! It'll put a smile on your face and a song in your heart, or wherever you keep such things! Only $14.95! 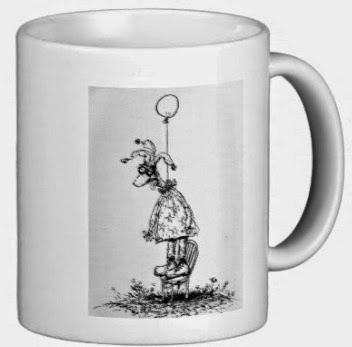 New from the Otterloop Shop; the Inevitable Coffee Mug! There are two pieces of merchandise that are inevitable in fundraising. The coffee mug is one of them (the other is, of course, the tote bag). So here's the coffee mug! It's got Alice Otterloop on it (twice), inexplicably wearing some kind of hat made from the Sunday comics and looking mighty pleased with herself. To order, go HERE. The present author relaxes pensively; behind him is the fruit of his labors, before him, the wide, wide world. The rest is history, though there remains one mystery: the original drawings disappeared, only to be found in a trashcan on the Post's fifth floor with the imprint of a sneaker clearly visible . Rescued from the trashcan, the art now decorates Gene's basement office. Here, for the very first time, as a special teaser, are the ANNOTATIONS I wrote to accompany the section of the book that has over 80 of the watercolor strips that appeared in the Washington Post. 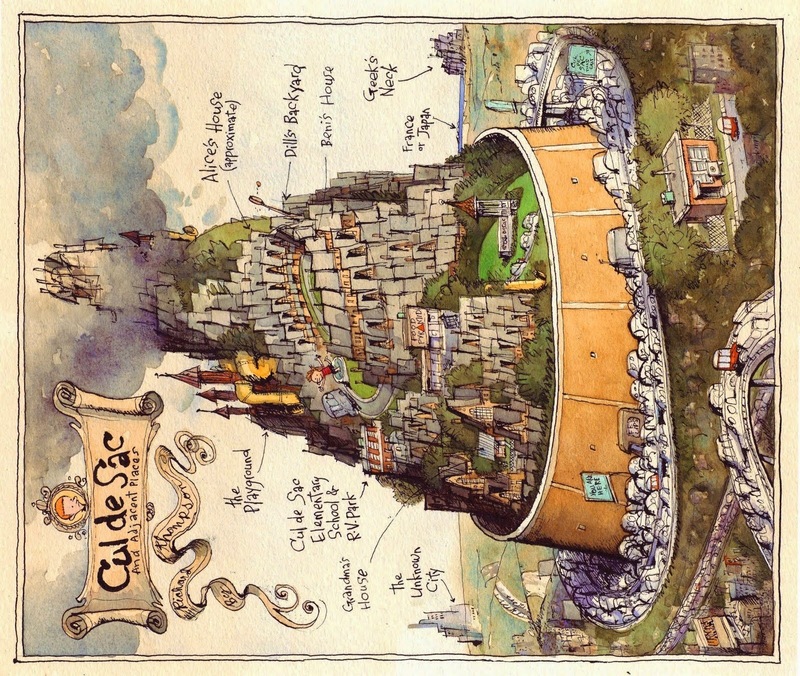 CUL DE SAC began as a sunday-only feature in The Washington Post Magazine in 2004. 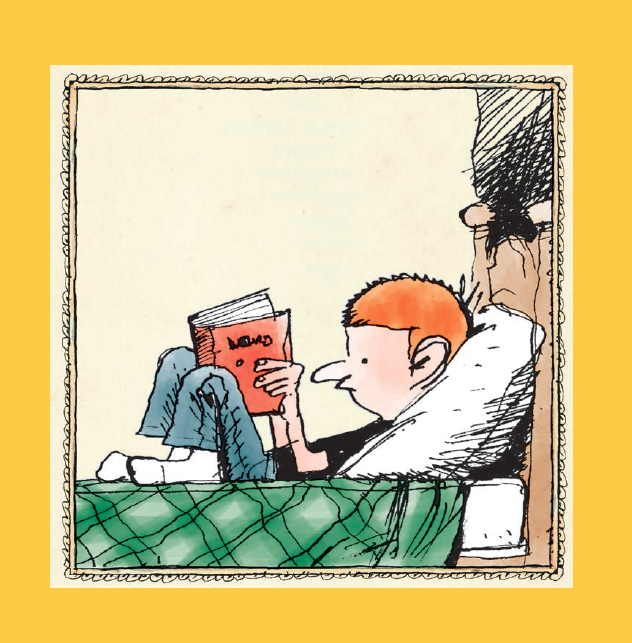 I painted them in watercolors instead of the process color needed for most newspaper comic strips. Here's an extensive sampling of them. 1. 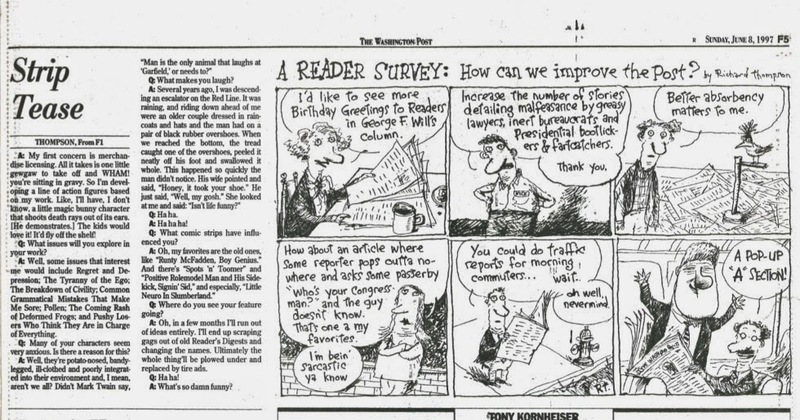 Here's the first peep out of Alice Otterloop, from the Washington Post Magazine of February 8, 2004. In a note at the bottom of the page to ever-patient editor Tom Shroder I wrote, "Tom, here it is. Gulp!" 2. Petey emerged almost fully-formed. I wanted the anti-Bart Simpson and I got him. 3. Beni and Dill and Dill's hat. Official Washington is very far away. 4. The whole class. Narjeel,got shortened to Nara and lost a braid for syndication. And Marcus looks different but has the same mother. 5. It's really the Washington Monument. 7. I went down to tha National Gallery and drew that vent so it's accurate. They also have nice lightswitches. 8. I went on school field trips to the National Gallery many times. The picture with the shark in it (Watson and the Shark, 1778, by John Singleton Copley) is every kid's favorite. 9. Akin to another, similar gag from when I, thought everything in the strip could talk. 10. Mr. Danders appeared fairly early on,,foisting himself, a talking animal., into a.kid srrip like an invasive specie. 13. This was all reused in the dailies. Nothing goes to ll,waste. 15. We're jumping around chronologically. This is from 2007, but it fits the " story". 16. This is 2005. They're on the DC Metro on their way to a Nationals game. 18. That beach house is not only a joy to draw, it's 100% accurate. 19. This is from 2004, but it fits in. Except for Alice's hair. 24. I'm very proud of all these puns. 25. Maybe my favoritec strip. The drawing didn't come together till I blacked out the walls. Suddenly- BANG- it jumped off the page. I like the acting too. It's very simple and understated,, mostly because I used the same rough for each panel. 26. Tai Shan is a giant panda born at the National Zoo in Washington D.C. on July 9, 2005 at 3:41 AM. He is the first panda cub born at the National Zoo to survive for more than a few days. He was very big news. 27. Alice shows unusual sense in panel two. I soon fixed that. 29. This one's weird. I'd thought of doing several set in a coffee house, thinking Alice would be a good foil for the self absorbed artsy types who congregate there. 30. The Grandma Saga in shortform. 31. One of the few t imes I played with the strip's format. I usually get lost when I try thistuff. To make it worse Alice has confused "escalator" and "elevator". There are several Metro stations that have this configuration. 32. Petey dreams of Christmas with music by Tchaikovsky. 33. Taking down Christmas is always so hard. I like the timing here. 34. Washington famously panics at the first sign of snow. 35. Once I got a grip on the perspective this was just a matter of writing funny place names. 36. An early out-of-body experience for Petey. 37. Here's the beginning of Danders' first Unintentional Adventure, from 2004. He was good at letting me pretend that the strip was about something else. 39. Danders assumes a new identity or is mistaken for someone else in each strip. His protean nature and talent for assimilation is his greatest defence. Or he's so bland nobody gives him more than a second glance. 40. Coincidence? Or cheap dramatic device? 41. The ease with which Danders forgets the whole point of his job makes me happy. So doees his pirate talk. 42. The spelling of Glandey High seems uncertain. 43. Oh, this was fun to draw. 44. Ocean City is an Atlantic resort town in Worcester County, Maryland. Ocean City is widely known in the Mid-Atlantic region of the United States and is a frequent destination for vacationers. It has many cheesy gift shops. 46. This is very close to a later strip I did as a daily, but this one's prettier. 47. There's a short story I love by the fantasist/tall tale teller R. A. Lafferty called "You Can't Go Back" about a bunch of kids who find a secret moon that hovers over the Osage country in Oklahoma. 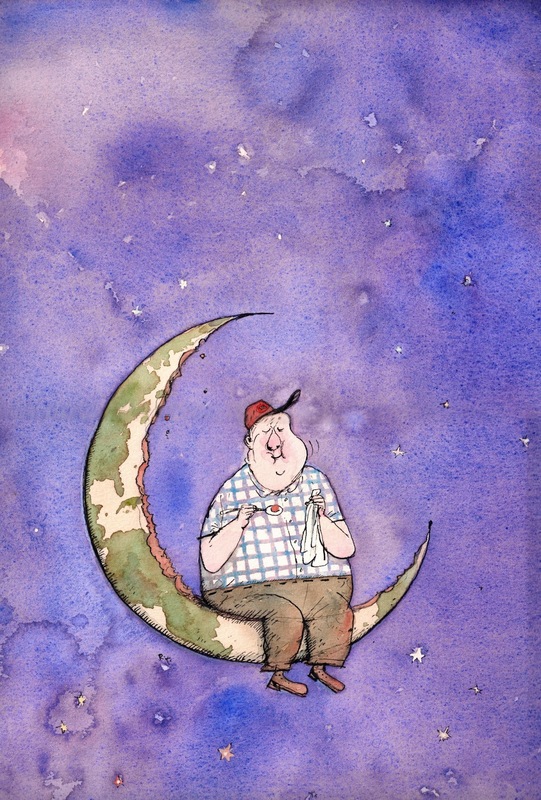 The kids get to the moon by whistling for it and climbing up from the roof of their grandma's truck. The image of a tiny moon appeals to me. 48. We lived within hearing distance (2 miles) of the Montgomery County Fair. 49. We went to the fair for years, so much that we recognized cows from one year to the next. And baked goods too. 50. Another of the strips set in a coffe shop. They're just not that funny. Too earnest. 52. The creepier side of Christmas. A German Expressionist Christmas has been done by someone, somewhere, I'm sure. 53. The second of Danders' Adventures, this one not so inadvertant. 54. FEDUPS struck me as hugely clever and funny when I thought of it, circa April 2006. I'm sure it's been independantly invented several thousand times at least, like all clever ideas. 55. 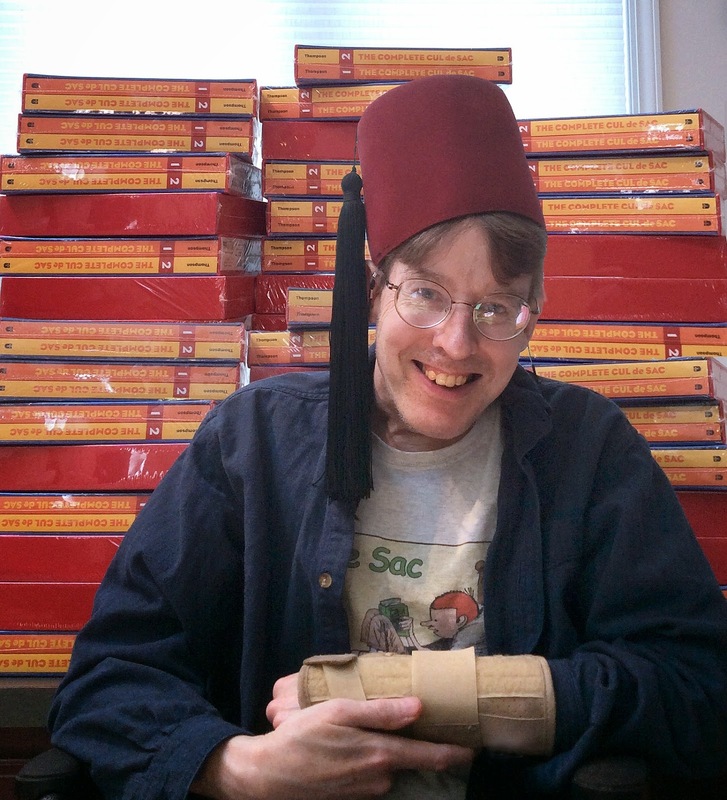 The FEDUPS guy is one of my favorite ancillary characters. 56. I like Ms. Fermat, the Urmart greeter with the knuckle tattoos, too. I should've introduced her to the FEDUPS guy. 57. A wall full spatulas and egg timers strikes me as hugely funny too. I doubt if either one's ever been independantly invented. And if so I don't wanna hear about it. 58. There is a lesson. I made this up as I went along, like usual, not too hard considering there was a week between each. 59. An epic of love and loss with egg timers and spatulas. 61. Art equals Creativity plus Neatness. I was alwayos bad at math. 62. Money does come from pants. 63. Back-to-Schol pants-buying is a grim time. Unless you've got seven cents to lblow. 64. With this appearance I suddenly understood Ernesto Lacuna. Not who he is, he's an enigma. I understood his comic potential as a Petey-provoker. He's based on several kids I knew who're now probably highly successful and maladjusted. 65. Petey wins a passive-agressive fight! 66. Hey! Petey's not under his blanket! 67. As a long-time Renaissance Fair-goer (participant to innocent bystander), I can attest that the above is historically accurate. 68. I've lived around DC most of my life. I've seen a well-known senator leaving a drug sttore with 3 bags bulging with toilet paper (on sale), a well-known TV newsman playing on a playground swingset while waiting to do a standup, and my own mother ram then-first lady Lady Bird Johnson in the shins with a stroller loaded with my then-baby brother (she apologized). I'm not impressed by much. 69. 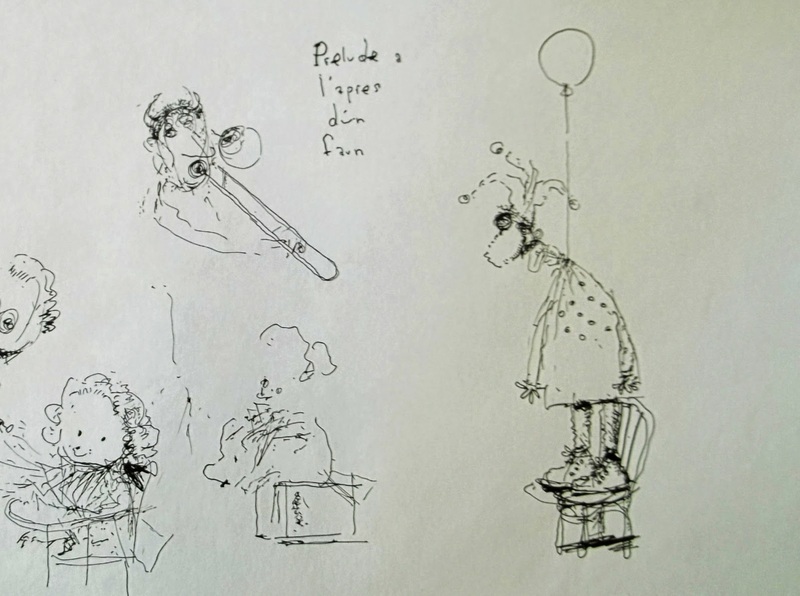 From when Petey played the trombone, and I found it too hard to draw . 70. This is my favorite field trip. 71. This would be a great day for a nose bleed. 72. Children wearing winter coats swing their arms funny when they walk. 73. I labored a long time ghostwriting the text for Oswaldo Twee's book, both mking it apropriately dire and making it fit. 74. In the cartoon of the class approaching the library there's a rgreen towel up in a tree. Maybe the sock was in another tree. 75. 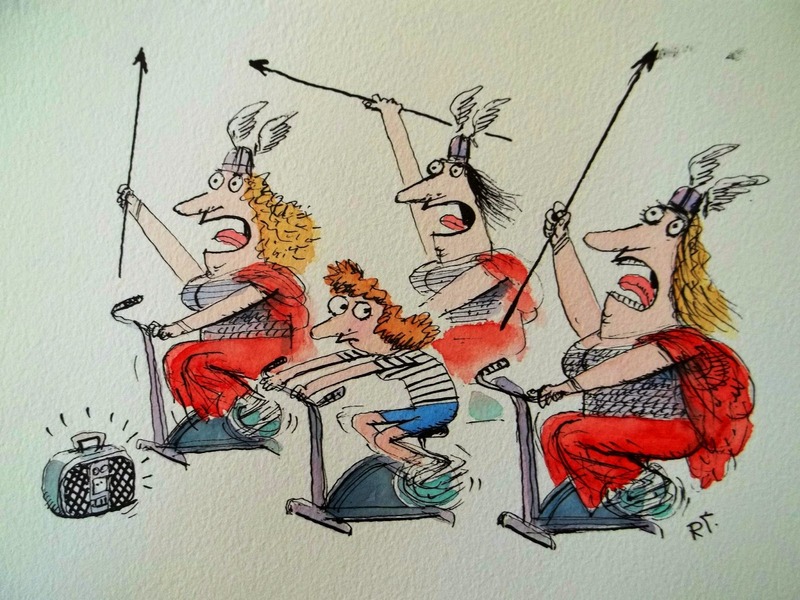 This is a painstakingly accurate depiction of a DC Metro train and of my dislike of cell phones. 76. Eskimoes had only a few words for snow, but it makes a good starting place for gags. They have hundreds of words for "gags". 77. The parking garage drawing makes me very happy at the safe distance of six years later. At the time it seemed confusing, nudged into coherency only when I put in the yellow arrows. Thank god for signage. 78. Drawn from life, alas. This appeared on the First of April, making Alice more up-to-date than I'd give her credit for. 79. The payoff: Alice gets the bum's rush, her usual fate in Sharing Time. 80. The Last of Danders' Unintentional Adventures, this appeared in the Post Magazine a few months before the daily strip launched in September of 2007. 81. Could that toy truck be the feral toy truck featured in the syndicated strip on page 250? Or do I know how to draw only one toy truck, making identification impossible? Whatever, the Metro station and train are 100% accurate. 82. This and the following strips were scanned from Post Magazine tearsheets, the originalsthe having been lost. Once, at this same museum, an unknown child of about 6 turned to me and snarled, " That's not a dinosaur! That's a pterosaur!" after I misidentified a Quetzalcoatlus out loud. Kids like dinosaurs. 83. This is an accurate view of the Smithsonian Museum of Natural History, to whom I lent the original and who then lost it. Butterfingers! The others I lost on my own. 84. The museum had recently opened a very impressive Hall of Mammals that my daughters loved. I was very familiar with the Hall of Mammals. 85. A museum press gang! Don't laugh, they're real. Beware. 86. The museum had a life-size model of a blue whale in their hall of undersea life that I loved when I was a kid (I thought it was real). When they redid the hall in the 90s, they gave the by-then decrepit blue whale to one of the contractors. Who put it, in pieces, in his garage. I thought an affable guard giving away bits of the collection to polite visitors was hilarious. Six years later I'm still waiting for the laffs. 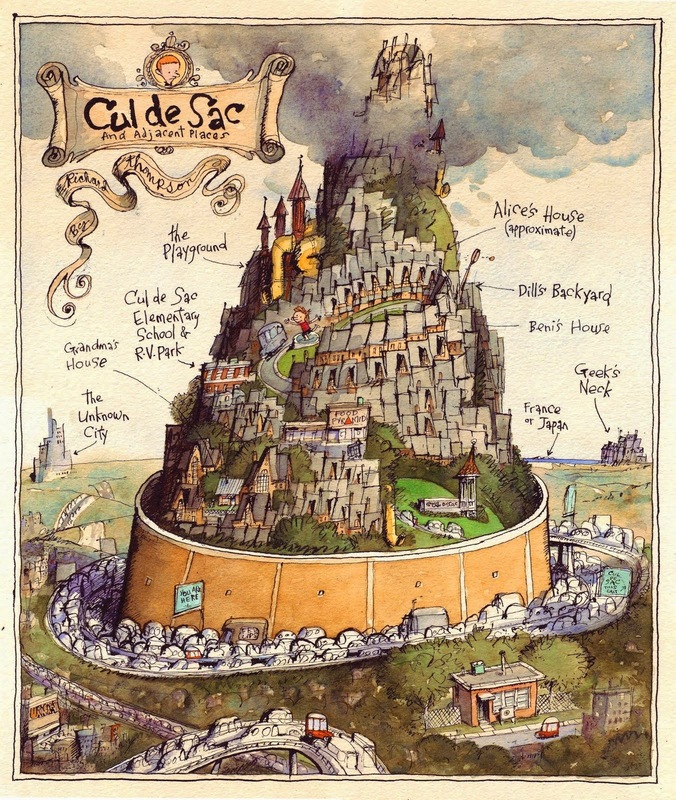 There are still a few issues we have to clear up, like do I want to be paid in cash or in chocolate?, but it appears the fine indy bookstore Just One More Page will offer copies of the Complete Cul de Sac SIGNED by the author (me). Just One More Page is familiar to anyone who loiters on this blog, as it was the launch site of the Team CdS book. So we're old friends. As always, we'll offer the signature in several styles, including our new rubber-stamped Ersatz style. 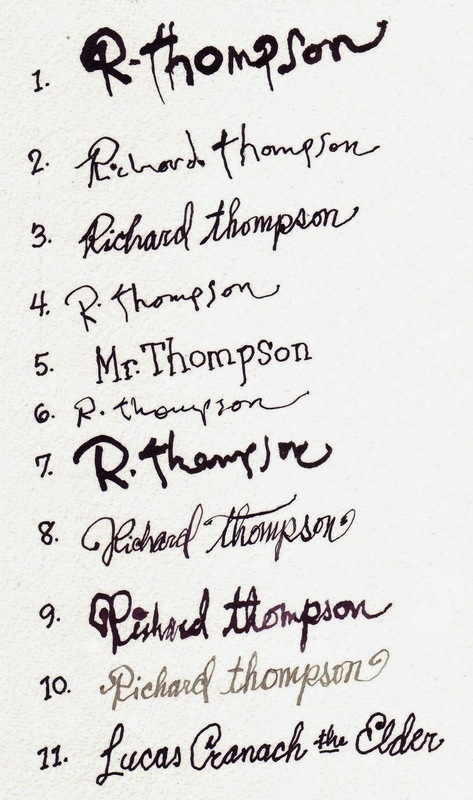 Ah heck, with the way things are going, you'll be lucky if you get a signature that's even barely legible. 1. Otterloop Bold Distended 2. Otterloop Grotesque 3. Palmer Method 4. Otterloop Hasty 5, Otterloop Serif Formal 6. Otterloop Extra-Hasty Verging on Sloppy 7. Otterloop Slapdash Bold 8. Otterloop Fancypants 9. Otterloop Wrong-End-of-the-Pen 10. Otterloop Corroding (genuine iron gall ink) 11. Otterloop Erratum (discontinued) Hey, I've seen these jokes before. Next from the Cul de Sac Collection: Postcards! The Map of Cul de Sac and Adjacent Place Postcards, smaller than you've seen it before, just 5.6"x4.25"! And- they're really mailable! These postcards are not toys; they really work! It's almost unbelievable!